The Tastemaker Top 10 is a collection of 10 questions asked by me and answered by some of my favorite bloggers. Here they will tell you a little bit about themselves, their blogs, and of course, their favorite foods and restaurants. On today's edition, we are talking to Amina of PAPER/PLATES. PAPER/PLATES is part food blog and part book blog and Amina is constantly finding cool ways to blend these two interests. Take some time to read about her today. P.S. Her answer to #2 is one of the most unexpected I have read so far! In a few sentences, tell us a little bit about your blog. PAPER/PLATES is a blog for readers and cooks. Every week, I feature a book recommendation and recipe pairing, as well as interviews with interesting people from the food or books worlds and round ups of the best food and lit content from around the web. 1. Favorite meal, food, or cuisine: Growing up in a Pakistani household in the Chicago suburbs, I spent many a cold night feasting on plates of keema and daal over basmati rice. If you're interested in trying it yourself, I shared my favorite daal recipe on the blog. 2. Least favorite meal, food, or cuisine: Bananas. Don't talk to me about bananas. 3. Favorite restaurant in your city: Bite Cafe in Wicker Park is an adorable spot whose menu completely intrigues me. So far I've tried the vegetarian poutine and bibimbap for brunch. I plan to go back and try everything else, too. 4. Favorite restaurant outside of your city: In 2009, I traveled with my family to South Africa. On our way to Cape Point, which is nearly as far south as you can go on the continent, we stopped for lunch at Bertha's in Simonstown. There I had, without exaggeration, the best meal of my life — seafood or otherwise. 5. Favorite food memory: In March, I made a raspberry tart in honor of B.J. Novak's book of short stories, One More Time. The tart was cooling on the counter when my friend Saba came over, tasted it and said it could've been professional. As an unconfident baker, that was the best compliment she could've given. 6. Favorite guilty pleasure food: I have an unending love for Sour Patch Kids that isn't really guilty but everyone tells me it should be. 7. Favorite ingredient (something you love to cook with, or something you see on a menu and know you have to order): Are there people who can be pick a single favorite ingredient? Here are a few: lime, cilantro, caramelized onions, cinnamon, basmati rice, cumin. Sour Patch Kids. Oh wait, wrong question. Soak the mushrooms in a bowl of warm water, 15 to 20 minutes or until soft. Strain the mushrooms into a fine sieve over a bowl and set liquid aside. Squeeze mushrooms dry with paper towel and chop. In a saucepan over medium heat, warm the broth until bubbles appear around the edge and hold at that temperature. In a small Dutch oven or heavy-bottomed saucepan, heat 1 tbsp. of extra virgin olive oil over medium-high heat and sauté shallot until translucent, about two minutes. Drop heat to medium. Add remaining 1 tbsp. oil and Arborio rice. Stir until rice is coated and sauté 1 minute. Add 1/2 cup of the hot broth and cook, stirring occasionally, until most of the liquid has been absorbed and the rice is just moist, about 3 minutes. Continue adding broth, 1/2 cup at a time, always waiting until the rice is just moist before adding more. After 2 cups have been used, add 1/2 a cup of mushroom soaking liquid, a splash of apple cider vinegar and the chopped mushrooms. When the liquid is almost fully absorbed, resume adding the broth. 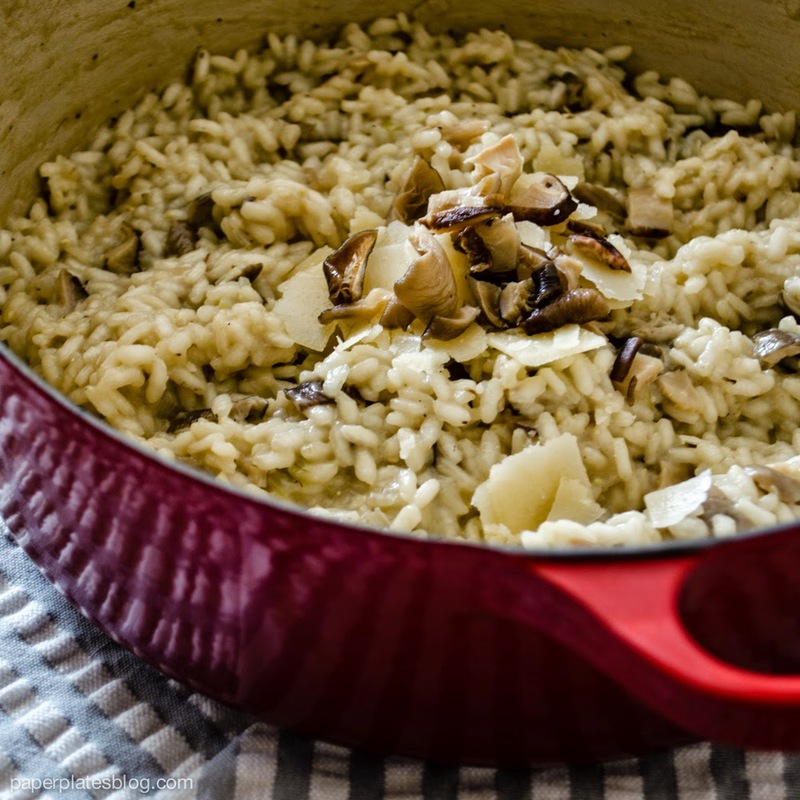 The risotto is ready when it is creamy and slightly soupy and the kernels are tender but still slightly firm at the center, about 35 minutes after the first addition of broth. Remove from the heat. Stir in Parmigiano-Reggiano cheese, salt and pepper. Serve immediately. Yummy Books: Cara Nicoletti is a fellow literary food blogger, who shares recipes from her favorite books. She's also the author of an upcoming cookbook called Voracious, featuring stories and recipes inspired by literature. Damn Delicious: I just discovered this food blog, which features recipes that validate the blog's name. Shutterbean: Another recipe blog with a side of life thrown in. This one's written by SF-based Tracy Benjamin, who does an awesome podcast with Joy The Baker (another favorite). The Garden Apt. 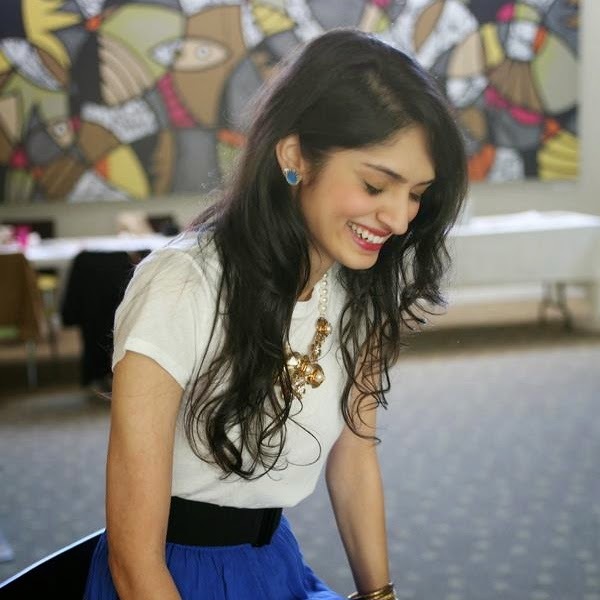 : Lindsay is a thoughtful Chicago-based designer who blogs about home, food, fashion, design — you name it. Plus, I love her Wearing Literature posts. Bookswept: My favorite book blog. Yuri posts photos alongside quotes from the books she's currently reading. She also her life around Berkeley, CA. Thanks so much for your thoughts, Amina! Thanks for the shoutout, Amina! You are too kind! I can't believe you don't like bananas, though!